It's Nepal's Biggest Holiday And Goats Are Not Happy About It : Goats and Soda The festival of Dashain brings thousands of goats to Kathmandu — for dinner, sacrificed to honor a Hindu goddess. Despite current unrest and post-earthquake trauma, the holiday will go on. A Nepali selects a goat to sacrifice for the Hindu festival of Dashain. This week, Kathmandu is a city of goats. People are walking goats on leashes on the sidewalk. On motorcycles, goats are sandwiched between the driver and the passenger. They teeter precariously on bus roof racks. And Nepalis are eviscerating freshly butchered goats by the roadside in the suburbs, while the goat head boils nearby on an impromptu wood fire. These tens of thousands of goats — along with sheep and big-horned mountain goats — are a sign of the most important holiday of the year in Nepal: the 15-day festival of Dashain. And because religion and politics are perennial bedfellows, the political situation in Nepal — unrest over the new constitution, the blockade of fuel from India — are having an impact on holiday plans. So is the aftermath of the April earthquake. But before we get to politics, we need to explain Dashain — and how goats got involved. The festival honors the Hindu mother goddess Durga, who slew wicked demons disguised as water buffaloes. It's the most important holiday of the year in Nepal. For the next five days much of the country will shut down. Newspapers stop publishing, restaurants are closed, hospitals have skeleton staffs. Water buffalo and other hooved animals pay dearly for their role as the symbol of evil in the Durga story. Goats are in the mix because they're more affordable and easier to transport than buffalo. On the ninth and 10th days of Dashain — Oct. 21 and 22 this year — mass sacrifices occur at all levels of society. Soldiers perform a mass butchering at dawn near Kathmandu's Durbar Square. Individual animals are sacrificed in front of village temples. Dashain is also a time when extended families get together. Thousands of Nepali migrant workers in the Middle East and students overseas come home, often visiting their elders in far-flung villages. They feast on ducks, chickens, pigs and, of course, goats, and they exchange gifts and money. But this year's Dashain, coming six months after an earthquake that killed 9,000 and left millions homeless, is darkened by a sense of gloom, deep political uncertainty and massive fuel shortages. Many Nepalis will be unable to travel for the holiday. The price of a goat has gone up to about $2 a pound. And, in general, people are feeling uneasy about the year ahead. "This year we can't afford a goat just for us so we are sharing one with two other families," says 42-year-old Keshav Thapa Magar. His house and almost entire village were destroyed by the quake. Indeed, the shadow of the earthquake hovers over Dashain. A family cannot celebrate if a relative has died in the past year. Thousands of Nepalis lost relatives in the quake. Even the former king, Gyanendra Bir Bikram Shah Dev, who abdicated in 2008 but remains involved in politics, has declared he will not celebrate Dashain in solidarity with quake victims. Then there's the fuel problem. For almost three months, the southern Terai region has mounted strikes and blocked borders with India to protest Nepal's new constitution. India, the sole supplier of Nepal's fuel, began an "undeclared" blockade of the borders a few weeks ago, starving its neighbor of gasoline, diesel and cooking gas. India says the border situation is too unstable to allow full cross-border trade. The lack of fuel has curtailed bus and car travel to villages. It has seriously affected the transportation of goats to Kathmandu, the country's biggest market. The dearth of propane cooking gas makes goat butchering more complicated as the goat needs to be scalded with boiling water to remove its hair. Some Hindus buy the meat already cut and ready to go. But many still perform the traditional sacrifice or have a butcher come to their house to do it. The goat is given tika — that's the vermilion dot used in religious ceremonies -- on the forehead. Its hind legs and head are firmly held as the butcher, wielding a large knife, cuts the head off in one blow. He usually keeps it as part of his price. "Head soup and head curry are really good," explains Jyoti Karki, who has a goat at his house awaiting this fate tomorrow. "We also cook the blood, very good with spices and vegetables." There is a wide array of worshipping, called "puja," during Dashain. Devout Hindu Nepalis even do puja for their mechanical assets. Vehicles and generators, even if they're empty of fuel this year, are garlanded with marigolds and prayed over to protect them from accidents or technical problems. 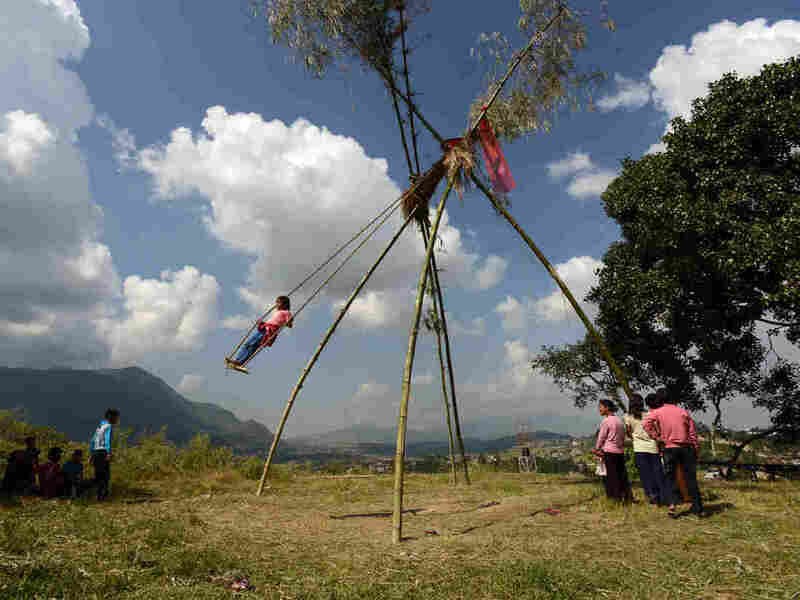 Would you like to swing on a "Dashain Ping"? Towering rough-hewn swings are erected for the Hindu festival. Nepalis like to have fun on Dashain as well. There are kite-flying competitions, and villages and city neighborhoods build towering bamboo swings that let swingers reach death-defying heights while standing on a narrow wooden plank, hands grasping a thick, rough rope. Even in such a dire year, some find a silver lining. India's "undeclared blockade" has been a boon to Nepali goat breeders. In previous years, cheaper Indian goats flooded the market, but this year the numbers have dwindled and local traders are expecting good profits. One of my Nepali friends turned vegetarian this year when his father died. The Indian blockade served as an added incentive. "Indirectly we are showing solidarity with the goats," he says, "but we are avoiding Indian goat consumption as well."